Today is a fun day! I am participating in a blog hop by One Million Pillowcase Challenge to celebrate the half-way point of the challenge – that means that half a million pillowcases have been made and donated to local charities. Wow! That’s a whole lot of love that quilters everywhere are spreading! If you have donated a pillowcase, reach your right hand over your left shoulder and give yourself a pat on the back. Last month, One Million Pillowcase Challenge made a Pinterest board of their 20 favorite patterns and asked readers to vote on their favorites by repinning them. By month’s end, the results were in – the most repinned pattern was the train appliqué #32. Each of the blog hop participants has been asked to make up this pattern and post a picture on their blog. I poked through Northcott’s sample room for samples of our newest collections and chose fabrics from a darling collection called Noah’s Jungle, shipping to quilt shops over the next 2 weeks. 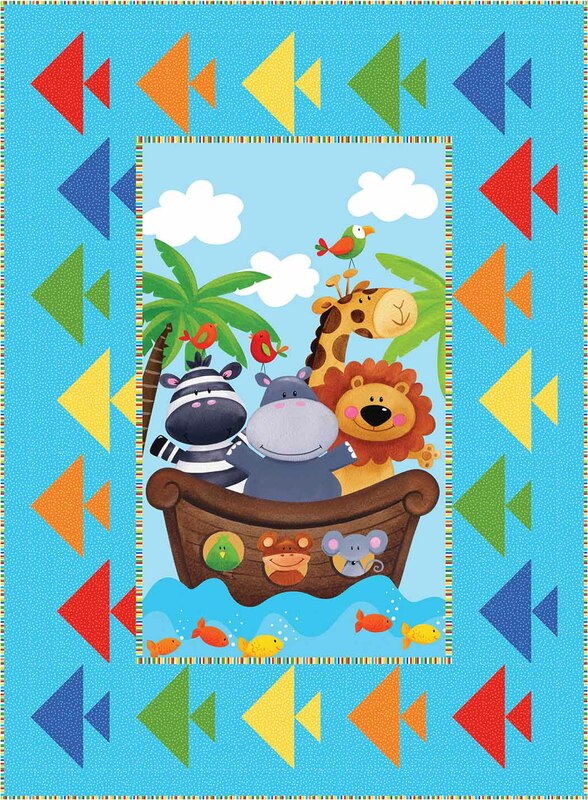 Noah’s Jungle, designed by Northcott’s Creative Director Deborah Edwards, includes a crib panel and pre-printed 10” squares, along with a multitude of coordinates. The panel and squares are ideal for quick kids’ quilts (it’s nice to get the quilt made before the kids grow up!). I chose the coordinates for the train pillowcase, and told my talented and trusty sidekick Susanne to go to town with the train pattern. She did a wonderful job, even fussy-cutting some of the animal characters and placing them on the train cars. Here is a picture of our pillowcase. This pillowcase would be a wonderful complement to either of the 2 patterns on Northcott’s website for the Noah’s Jungle collection – Kate Mitchell’s “One Fish, Two Fish” or Laura Blanchard’s “Follow the Leader” – on a toddler bed. Here are pictures of Kate’s and Laura’s patterns. Now that the pillowcase is made, I need to donate it. First I visited www.allpeoplequilt.com/millionpillowcases/ and registered my pillowcase – the total clicked to 508,700! My quilt guild donates cuddle quilts to a few worthy local charities, including Yellow Brick House, a women’s and children’s shelter (www.yellowbrickhouse.org). I checked out their website and was astounded to learn that 75% of children that witness abuse will themselves be perpetrators or victims of violence in adulthood unless intervention is received. These shelters provide a critical step in stopping the cycle and getting these moms and kids back on track. I clicked on the website’s wish list, and saw that school supplies top the list of items urgently needed, so I will pick some up and include them with the pillowcase when I drop it off. It will help lessen the burden of a struggling mom, and the pillowcase will hopefully be a constant reminder to a child that someone cares enough to make him or her something special. If you visited my blog before, you know that I like to give things away. 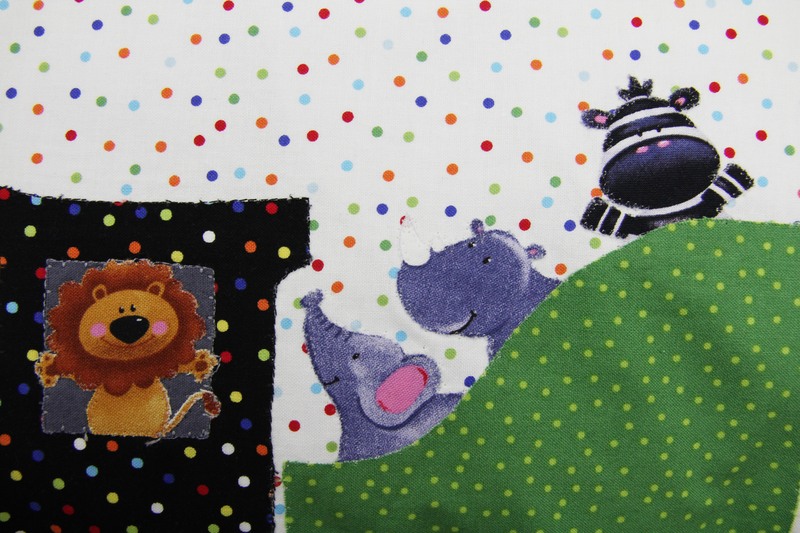 Today’s giveaway is a packet of Noah’s Jungle fabrics! 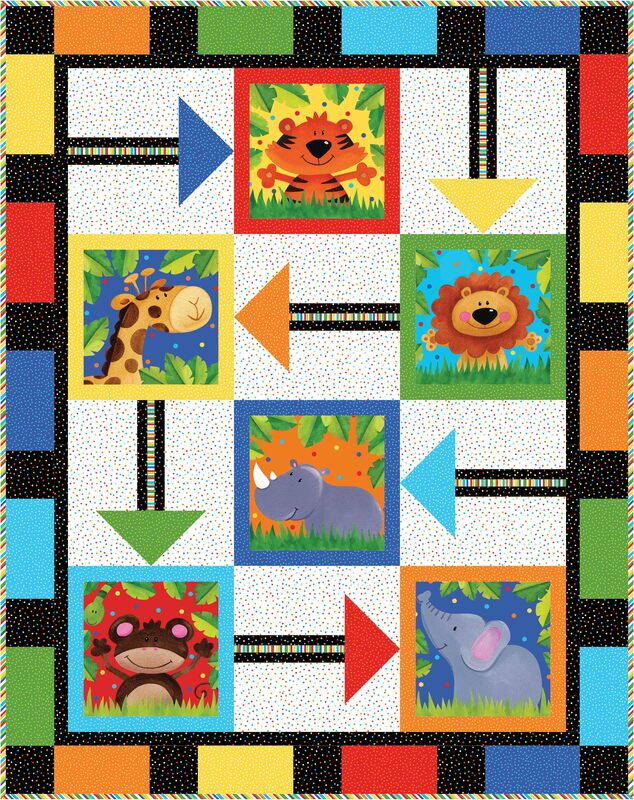 Please post a comment telling me your favorite Noah’s Jungle quilt pattern (Kate’s or Laura’s) by August 23rd for your chance to win a packet. I will choose 3 winners. Good luck, and keep making and donating those pillowcases! Laura’s quilt is my fav! Both are very cute, but I have to say I like Kate’s best. I love the triangles–just wish I could be successful with triangles! I love both but for me it would be Kate’s, we are fishing people! My granddaughter (6mths) would love those bright colors! Here is hoping with fingers and toes crossed! So cute! 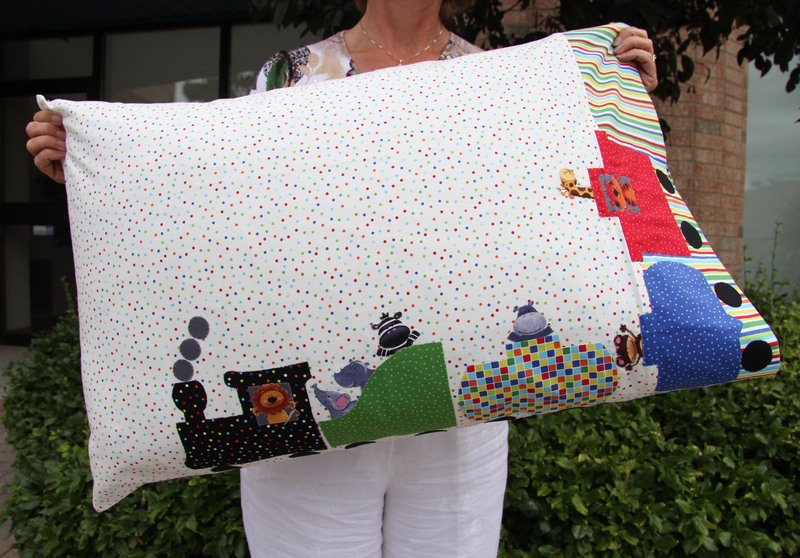 I have made many pillowcases during the challenge to donate to the Children’s Cancer Ward at our local hospital! Great giveaway, thank you! I like Laura’s although it’s difficult to choose either when they both are so attractive. Your pillow case is sweet. Oh, boy, hard to choose. I love them both, but I think I’d actually like to make Laura’s. My godson and his wife are expecting a little boy any day now. I’ve already finished his newborn quilt, but that would sure be cute for his 1st Birthday quilt. The pillow case is also adorable. So you want us to play favorites, eh? Nope, I give them both two thumbs up. My “mug” and my “wump” are firmly planted on the fence. And there’s a lot to plant, too. That is so Patti, you wouldn’t just donate an amazing pillow case but you would take the time and make the effort to include school supplies. Patti you are such an angel for Northcott. Oh I just love them both!! Love the bright and cheerful colors!! I might have to adopt some “Grandchildren” so I can make these adorable quilts!! It’s a tough choice, but I do like Kate’s the best. I particularly love the fish surrounding the panel. Nice touch. Laura’s: Love making those pillowcases for charity groups! They are both delightful, but if I have to choose, it would be Kate’s. I love seeing the animals in the picture together – it looks like they are taking a very joyful ride. Thank you for sharing and thank you for sewing pillowcases! both those quilts are just so cute….the lauras quilt is way cool…love the use of the panel…. Being in a bad motorcycle accident 3 years ago any help I can get to get back into quilting anything would help! Still trying as hard as I can but right now it is hardly working! I do everything too. I crochet, knit, cross stitch needlepoint latch hook, weave. You name it I can learn it or do it but trying to keep myself busy is not that easy anymore due the brain injury I got in the accident. If anyone can help at all that would be so appreciated! Both are wonderful but I would choose Kates. The pillowcase is great. Hard to choose but I have to go with Kate’s. Patti, I was lucky enough to be at your presentation this morning at Along Came Quilting in Calgary. Now I have lots of ideas for those panels! My creative juices are flowing. I like Laura’s, best, because it looks less like a panel. I’m a lover of kids prints and these fabrics are so much fun. I adore the cute animal faces. Choosing a favorite is difficult but the fish are speaking to me so I have to choose Kate’s quilt. Patti, thanks letting us know about your blog. They are both cute but I choose Laura’s quilt. Love the pillowcase. I vote for Kate’s quilt. The fish are a perfect complement to the boat in the water. After thoroughly enjoying your trunk show at Lori’s Country Cottage tonight, I noticed how the fish make your eyes travel around the quilt. Excellent presentation this evening – very informative. I learned a lot and can’t wait to try the tip for mitered corners! ooooh, tough decision. Such nice bright colors!! Since I have to choose, I would select Laura’s quilt. Thanks for the inspiration! I prefer Laura’s quilt. More for the baby to be fascinated by. The pillowcases are interesting too. Can’t wait to use all your suggestions on how to use panels to make really different quilts quickly. I like both, too. But I would have to say that my favorite is Laura’s quilt “Follow the Leader”. My weekly sit n sew group like to make pillowcases for ConKerr Cancer. We meet weekly and once a month we work on pro bono projects. Thanks for the chane to win some of this cute fabric. The quilt with the most interest and the one I enjoy the most is Laura’s quilt. it is interactive, colorful and fun. I think this material is the best. thank you. I like Laura’s the best too. But both are very cute. I will have to look for this fabric in the stores.